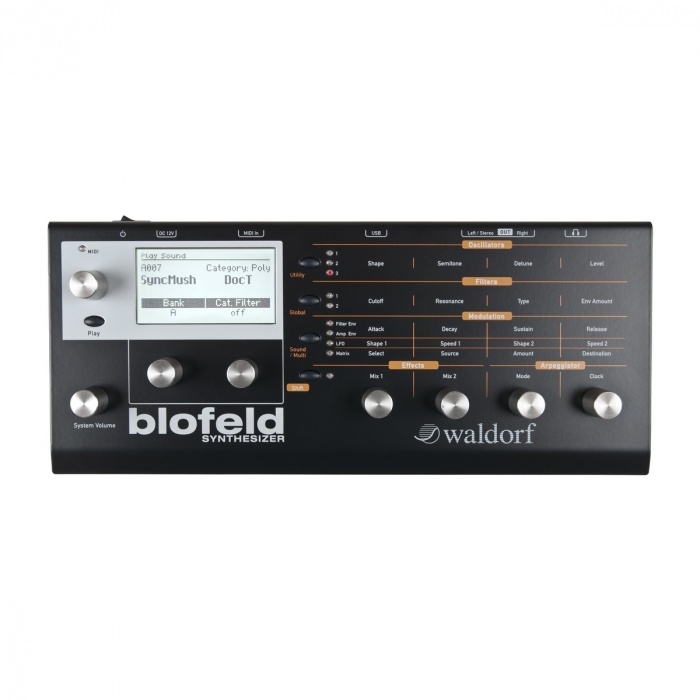 The Blofeld Black from Waldorf is a desktop synthesizer module with over 1,000 sounds, many of which are derived using the company's Q synthesizer oscillator models (all of which are included), along with all of the Microwave II/XT/XTk wavetables. The present synthesis system is based upon the PPG Wave synthesizers of the early '80s, delivering edgy, hard-hitting and bell-like timbres, alongside the warm, organic analog sounds of the Q series. The synthesizer is 16-part multitimbral and provides up to 25 voices. Each voice has three oscillators that offer authentic circuit models of analog waveforms, while oscillators 1 and 2 feature the two wavetables that were introduced by the Waldorf Q. Control over the brilliance of these wavetables is available, especially important for waves with lots of harmonics in the bass end. Brilliance also affects the sawtooth and pulse oscillator models, delivering everything from warm and soft string pads, to the hard shapes needed for punchy and biting bass sounds. Four envelopes with different types and trigger modes affect any sound parameters. Oscillators 1 and 2 can be ring-modulated, and a noise generator delivers white noise that can be filtered low or high pass, depending on the noise color setting. The three oscillators, the ring modulator and the noise generator can be freely mixed into filter 1 and filter 2. The two multimode filters per voice can be routed in series or in parallel with each filter having its own pan parameter for easy creation of stereo sounds. The unit offers a freely controllable "Drive" function behind each filter with more than a dozen curves. Needless to say, the modulation possibilities in the synthesizer are huge. Dozens of modulation sources can be connected to all the important sound generation parameters using a sixteen-slot modulation matrix, plus all the pre-routed modulation destinations. Additionally, the modulators themselves can be modulated. Each of the three LFOs offers sine, triangle, square and sawtooth waveforms, plus sample & hold and random and all can be synchronized to MIDI clock. The arpeggiator features variable clock divisions from 1/64 triplets to more than 1,000 bars, with variable swing/shuffle, a range of up to ten octaves with multiple trigger styles provided. On the effects side, two slots are available for a multitude of processors, including dynamics, EQ and time-based effects. Finally, the user interface sports a huge graphic display providing precise visual feedback. Seven endless rotaries plus a volume knob all made of steel help the user in exploring the depth of the synthesizer. License SL is an optional license that can be purchased for those users who wish to play samples through the Blofeld sound engine. The license releases 60 MB of built-in sample flash memory for loading factory or user samples. The samples and multi-samples go through the synthesis engine just like oscillators do. Additionally, a range of optional Soundsets are available for purchase, featuring new patches, and in some cases MIDI files, extending the sonic capabilities of the instrument.